My day job as a Quality Assurance Auditor in the Property Sector, unfortunately presents few exquisite lunch opportunities. 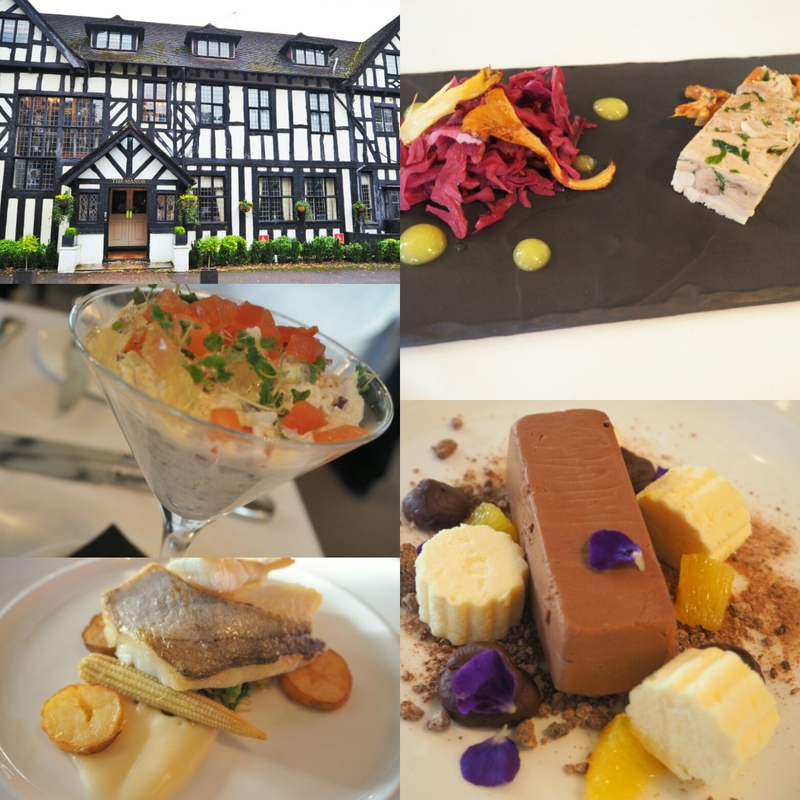 Therefore, I couldn’t resist the opportunity to write about my lunch at The Manor Laura Ashley Hotel when I received an invite for a working lunch. As you follow the private driveway up to the hotel, a stunning black and white 16th century building is visible through the trees. With ample parking at the hotel, you walk to the huge front door and take in the beauty of the building and stained glass windows. 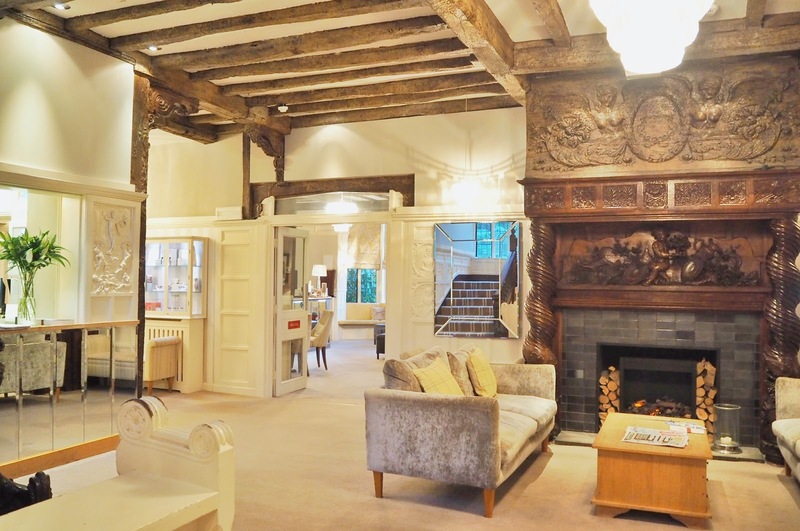 A homely reception awaits as you walk through the door, take in the intricately carved wooden fireplace with log fire and scattered newspapers. The furnishings, soft grey velvet sofas complimented by bright yellow cushions and glass framed mirrors, give the room a modern twist. – it is Laura Ashley after all. 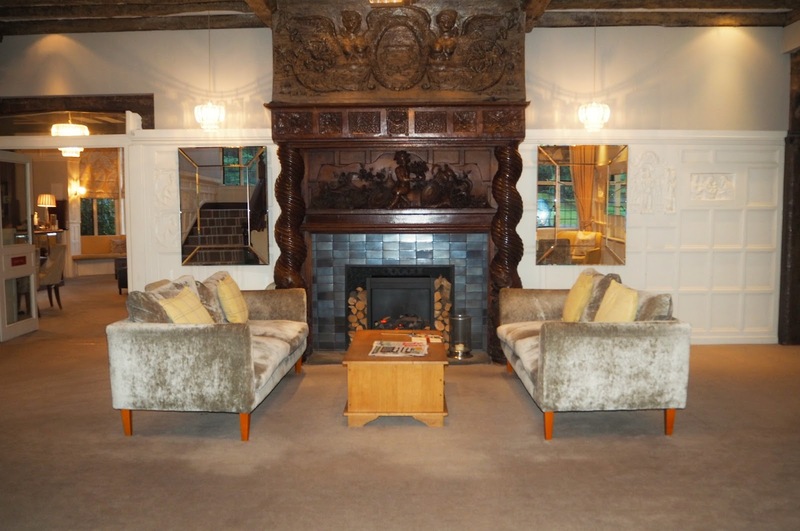 The layout of the opening room to the hotel has a relaxed ambiance and you could easily walk in with your weekend bags and plonk yourself down on the sofas. One guest was working quietly on his laptop in one of the corner seating areas as we walked in. As we approached The Cavendish Restaurant, we were greeted by a waiter who politely asked if we would like him to take our coats. The restaurant has a feeling of grandeur, probably down to the exposed beams, the structure of the building and eye-catching drop glass chandelier. Though, the dining area is made less formal by the simple white and cream decor. I would imagine this room to be particularly bright and welcoming at breakfast for those staying at the hotel. As we sat down in our chairs I observed the crisp white linen table cloth with matching napkins, perfectly polished wine glasses and weighty cutlery. All signs of the fine dining experience to come. 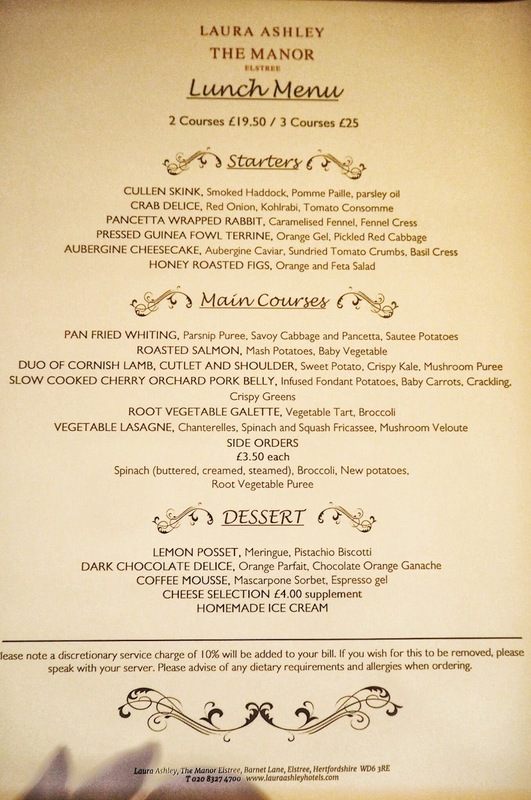 Despite the fine dining and grand appearance, the hotel actually offers a reasonably priced lunch menu with two courses for £19.50 and three courses for £25.00 per person. 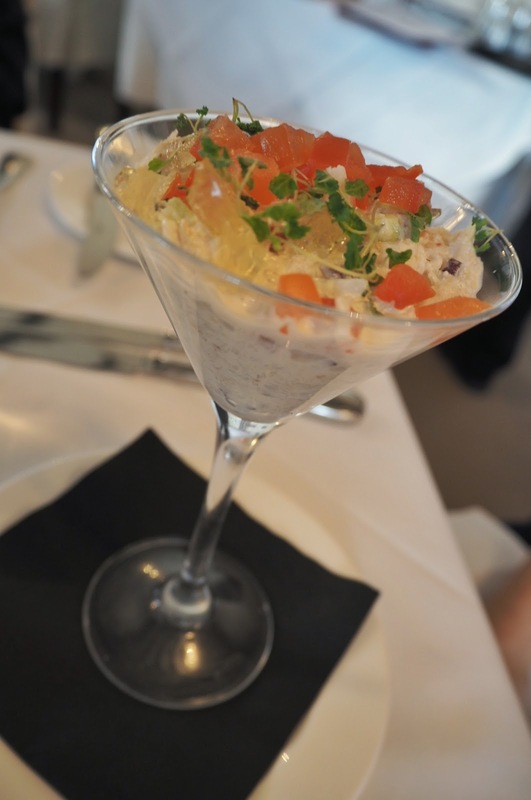 The starters may be on the exotic side if you’re dining with fussy eaters, consisting of fish dishes such as haddock and crab with other dishes such as rabbit perhaps not appealing to some. Being the proud owner of two rabbits, as nice as it may taste, I couldn’t possibly eat one now; though each to their own. To start, I ordered the Cullen Skink: smoked haddock, pomme paille with parsley oil. I knew I liked haddock and being unfamiliar with a Cullen Skink or pomme paille, I Googled the latter meaning “apple straw” in French upon my return to the office. 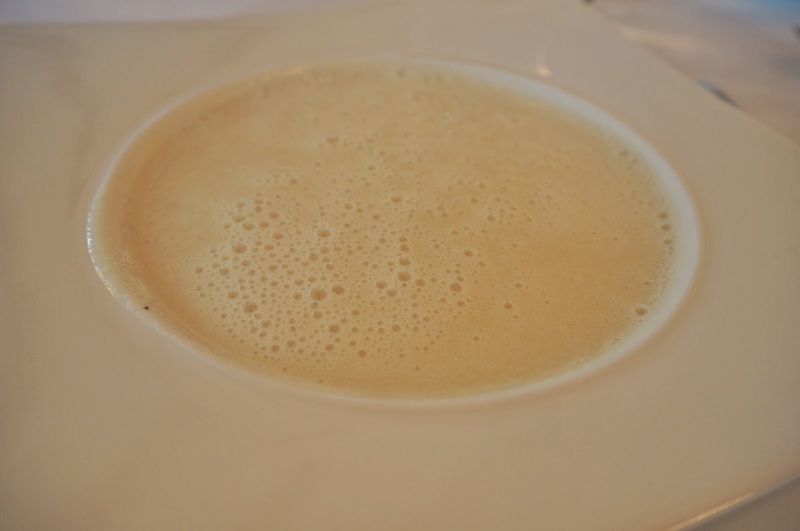 To my surprise,my starter was a soup, a Cullen Skink unbeknown to me, is a classic thick Scottish soup. Pale of colour, the Cullen Skink was not too dissimilar to the clam chowder I enjoyed in San Francisco – the culinary delights of my trip can be viewed by clicking here. The Cullen Skink was not as thick a texture as the clam chowder and had more of a light bisque appearance. The soup was ideal as a starter, not too heavy and if I was being picky would have benefitted from a bit more pepper. Though, all down to preference. 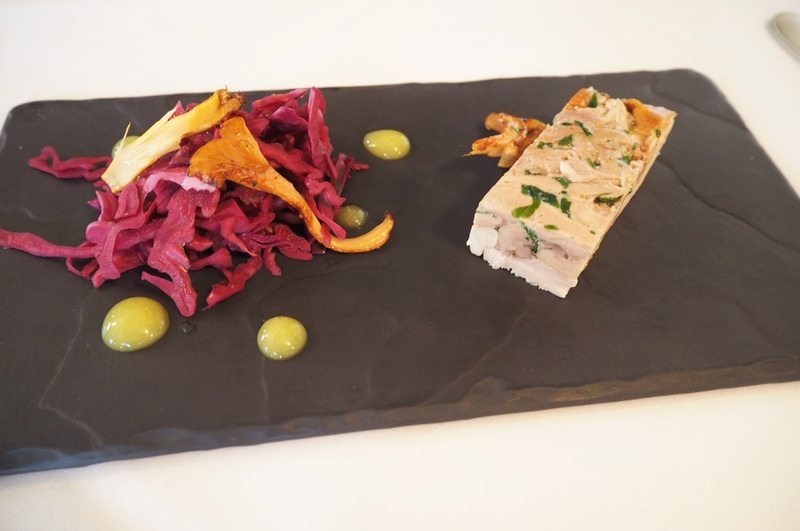 My dining partners ordered Crab Delice with red onion, kohlrabi and tomato consomme and Pressed Guinea Fowl Terrine with orange gel and pickled red cabbage served on a slate board. 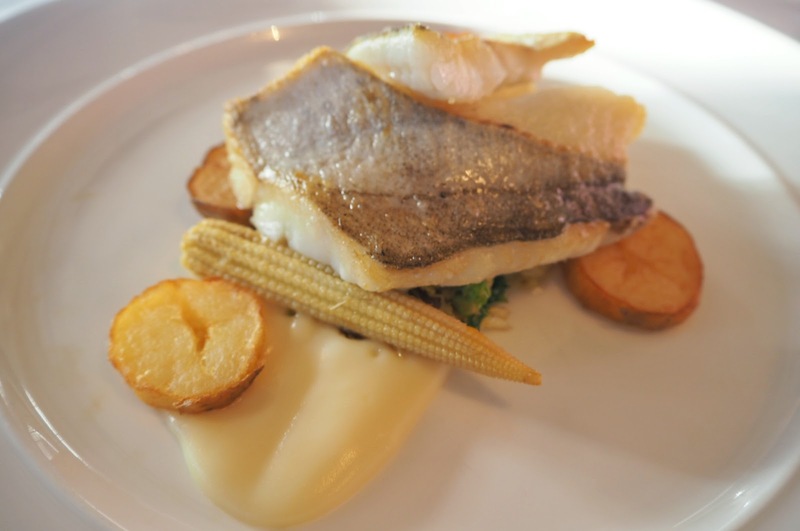 The food, including our mains of Pan Fried Whiting with parsnip puree, savoy cabbage, pancetta with sautéed potatoes were beautifully presented. The whiting was cooked to perfection with soft pillowing flakes and the mild flavour was complimented by the pancetta and savoy cabbage. The cabbage was slightly on the salty side, which may not appeal to all tastes but to me tasted great with the crispy sautéed potatoes. When it comes to puddings and food in general, in all honesty it doesn’t take much to tempt me, particularly when my favourite chocolate ‘chocolate orange’ is offered as a dessert… Having developed a very fond liking for dark chocolate since trialing the beauty chocolate Esthechoc, the Dark Chocolate Delice with orange parfait and chocolate orange ganache was my choice for dessert. Beautifully served in an arrangement of purple petals and orange pieces with crumbled chocolate, I couldn’t wait to tuck in…after taking a photo obviously! As expected, the Dark Chocolate Delice had a smooth, rich velvety texture with a mousse-like quality. 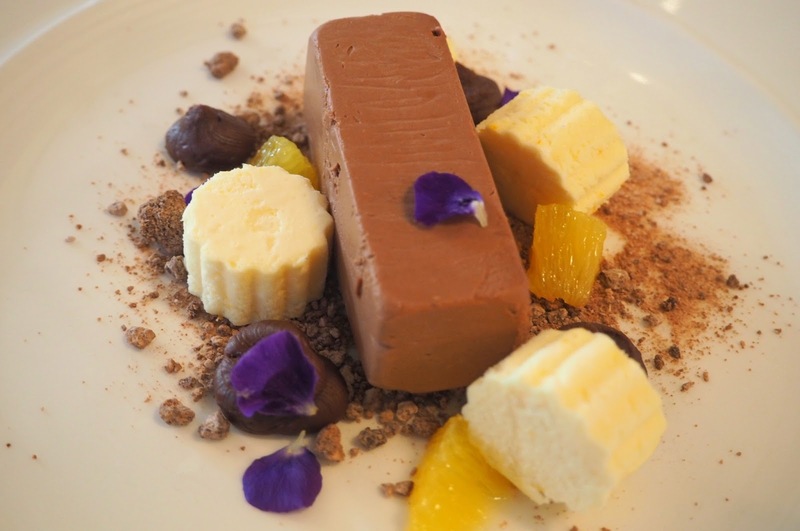 The sweetness of the chocolate and orange was contrasted by the sharp, tangy taste of the orange parfait, which was a little too sharp for me but an enjoyable dessert nonetheless. 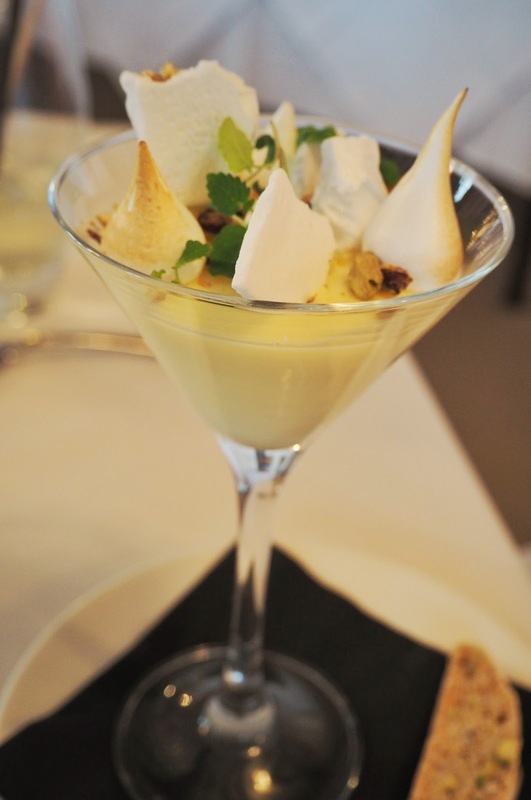 My fellow diners enjoyed the Lemon Posset served in a cocktail glass and Coffee Mousse, which itself looked like a piece of art. Service was impeccable during our working lunch and our waiter was very courteous when we still hadn’t read the menu on his third trip to our table. 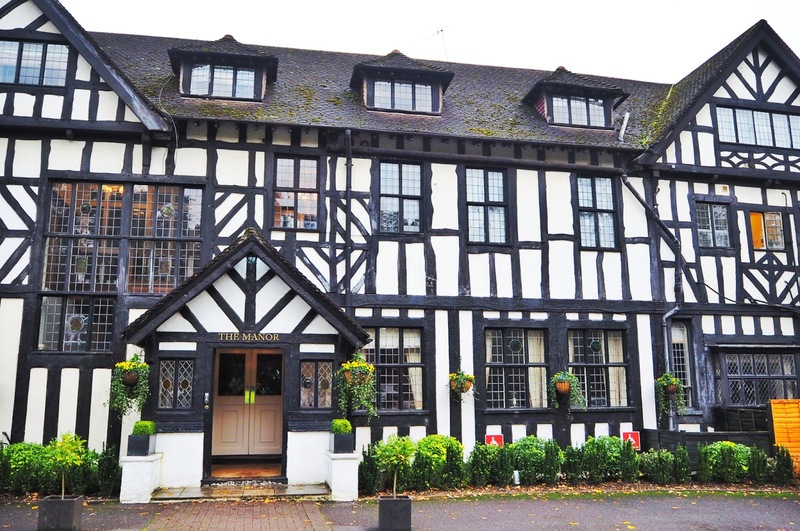 The Manor Laura Ashley Hotel offers relaxed country dining with a central base to both Elstree and London. 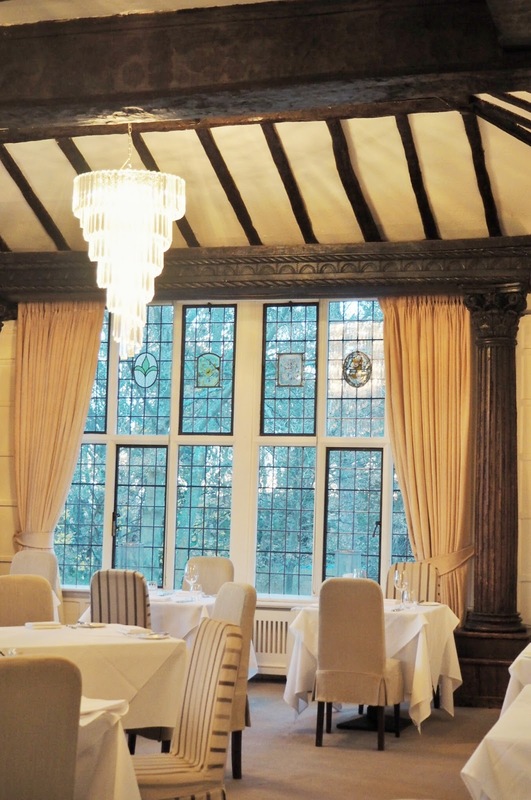 As a diner, you can’t help but be swept up in the rustic, homely feel of the hotel, whilst enjoying the fine dining and beautiful architecture. 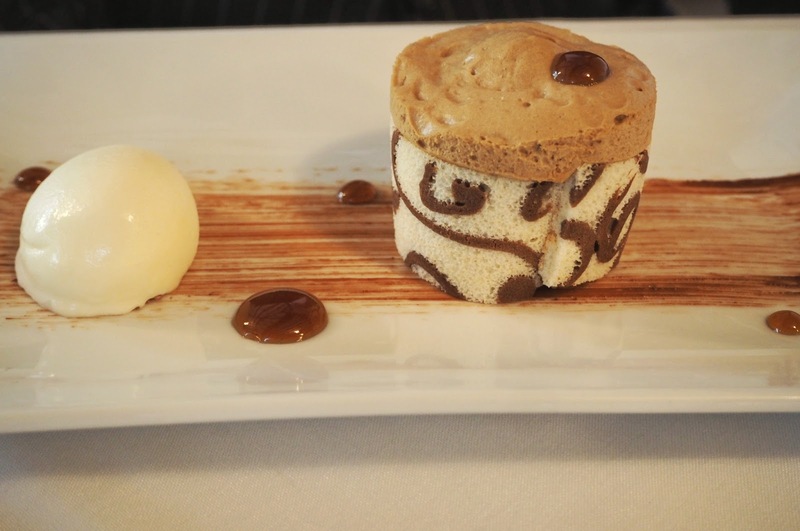 For a picturesque venue, the lunch menu is affordable and offers a range of dishes you may not otherwise eat at home. 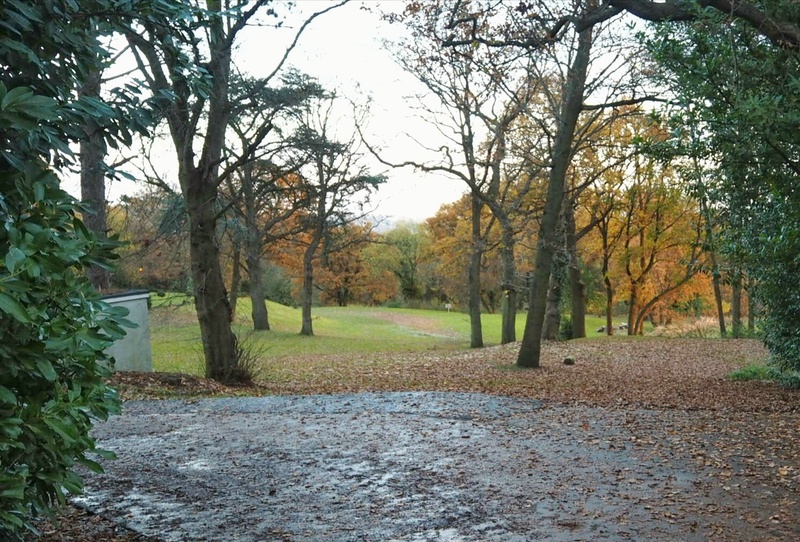 I would not hesitate to return and would love to stay in the hotel and explore the ten acre grounds of natural woodland, which are in full Autumn colour. There is even a giant chess set visible in the grounds!